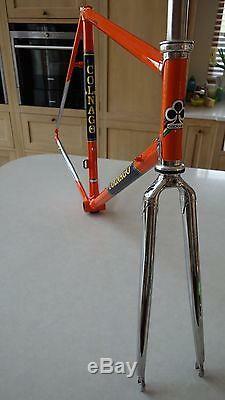 For sale a mint condition Colnago Master X-Light Frame, Precisa Forks, and Campagnolo Headset and Campagnolo Seat Binder Bolt. 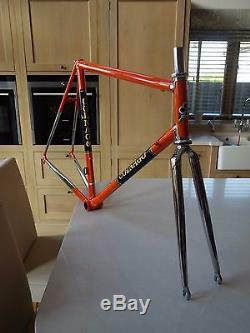 This frame has been professionally resprayed by Rourke Cycles in Molteni Orange livery PRMO (a la Eddy Merckx) the frame was originally white (PR99). 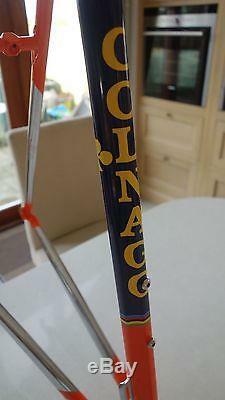 The blue panels on the down tube and seat tube with the yellow Colnago writing has been painted rather than decals so the finish is to a higher standard than the Colnago paint. The frame has not been built up since being resprayed (in Jan 2017) so as such the paintwork is presented in absolutely mint condition. There are no dents, or issues such as scratches or scrapes to worry about (see photos). Head tube is 15cm (not including the headset cups). 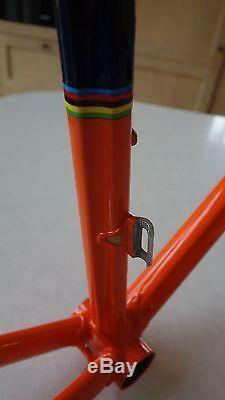 Bottom bracket is Italian threaded. Standard 100mm front, 130mm rear axle spacing. 27.2 dia seatpost required. 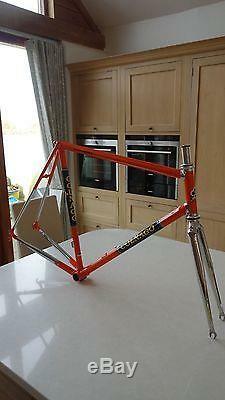 When I had the frame resprayed I also has downtube bosses brazed on. This allows you the choice to install either downtube shifters if you wish for the full retro look (and Eroica compatible) or modern ERGO/STI shifters. 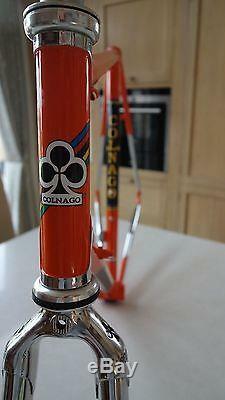 Colnago has supplied Master frames this way in the last year or so, for Eroica event compatibility. The frame will be posted anywhere in the UK free of charge in a proper cardboard frame box, and be very well bubble wrapped. The item "Colnago Master X-Light 56cm frame and precisa forks" is in sale since Friday, March 17, 2017. This item is in the category "Sporting Goods\Cycling\Bike Frames". The seller is "thechristopher2000" and is located in Attleborough.